Behold the fancy mustachios of Ignatius Bartholomew Pompus XXXVII! Tyler is on a roll this past week — I’ve bookmarked each of his last four builds to blog, only to be overtaken by an even better build (or one of our other bloggers). 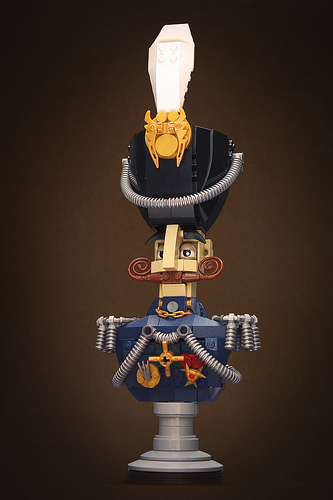 His latest LEGO model is a character called Ignatius Bartholomew Pompus XXXVII, who has a fantastic mustache he should be very proud of, but is apparently the Archduke of Arrogance. Tyler himself is one of the nicest, humblest people I’ve had the pleasure to meet, so I’ll take his word for it. While your eye is inevitably drawn to the many colorful details of Ignatius Bartholomew Pompus XXXVII himself, I especially enjoy Tyler’s presentation. Tyler has built Ignatius as a bust on a stand, and photographed him from slightly below “eye-level” to heighten the impression of arrogant disdain. Finally, Tyler Photoshopped Ignatius onto an antique-looking background. All in all, this is much more than just an interesting combination of bricks. I’m really impressed with this one. It’s just perfect. As you said, the presentation elevates the creation to an impossible quality level. This round of Iron Builder is going to be quite something.